After a failed attempt in 2018, California lawmakers will again hear arguments for the institution of so-called "right to repair" legislation that would compel electronics makers to provide repair manuals, tools, parts and other related material to consumers and independent repair outlets. California State Assembly member Susan Talamantes Eggman on Monday announced the introduction of Assembly Bill 1163, which will require manufacturers like Apple to "make service literature and equipment or parts available to product owners and to regulated, independent repair shops." "For nearly 30 years California has required that manufacturers provide access to replacement parts and service materials for electronics and appliances to authorized repairers in the state. In that time, manufacturers have captured the market, controlling where and when we repair our property, and inflating the electronic waste stream," Eggman said. "The Right to Repair will provide consumers with the freedom to have their electronic products and appliances fixed by a repair shop or service provider of their choice, creating a competitive market that will be cheaper for consumers and reduce the number of devices thrown in the trash." The bill, officially filed as legislation relating to electronic waste, is Eggman's second try at right to repair legislation. Her first attempt, 2018's Bill 2110, was introduced last March and subsequently died in assembly that November. Like the pending Bill 1163, last year's tendered legislation was crafted as a play to reduce e-waste. Eggman's announcement includes a word-for-word reproduction of an explainer included in 2018's press release for the now-dead Bill 2110. In it the lawmaker argues that customers who are unable to pay for manufacturer repairs are forced to replace broken equipment like smartphones, TVs and home appliances. Beyond financial benefits, Eggman also says that the repair and reuse of electronics is more efficient than purchasing a new device, noting that such measures can "stimulate local economies instead of unsustainable overseas factories." 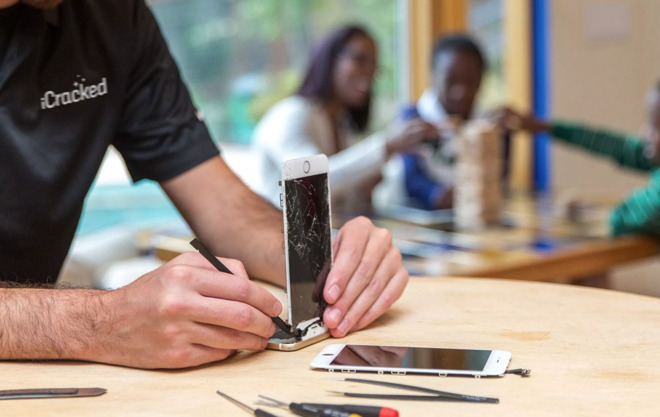 Repair firm iFixit, a steadfast right to repair proponent, publicized Eggman's announcement in a press release sent out to media on Monday. Apple with its strict in-house and authorized third party repair policies is a primary target of right to repair bills. The company is openly opposed to such legislation, saying access to repair material would expose industry secrets and create security and safety issues for customers. The right to repair movement has so far failed to gain traction in state governments, in part due to lobbyists contracted by Apple and other manufacturers. Right to repair advocates, however, claim companies that oppose legislation like Bill 1163 do so merely for financial gain. The repair business is a lucrative one, and opening it up to independent firms would lower customer costs by introducing competition, some argue. The right to repair movement got a shot in the arm earlier this year when Allstate purchased repair firm iCracked. With its second attempt at right to repair, California joins a cadre of 19 other states with similar legislation on the table.